As the 40th anniversary of the Supreme Court’s Roe v. Wade decision approaches, the public remains opposed to completely overturning the historic ruling on abortion. More than six-in-ten (63%) say they would not like to see the court completely overturn the Roe v. Wade decision, which established a woman’s constitutional right to abortion at least in the first three months of pregnancy. Only about three-in-ten (29%) would like to see the ruling overturned. These opinions are little changed from surveys conducted 10 and 20 years ago. Decades after the Supreme Court rendered its decision, on Jan. 22, 1973, most Americans (62%) know that Roe v. Wade dealt with abortion rather than school desegregation or some other issue. But the rest either guess incorrectly (17%) or do not know what the case was about (20%). And there are substantial age differences in awareness: Among those ages 50 to 64, 74% know that Roe v. Wade dealt with abortion, the highest percentage of any age group. Among those younger than 30, just 44% know this. The latest national survey by the Pew Research Center, conducted Jan. 9-13 among 1,502 adults, finds that abortion is viewed as a less important issue than in the past. 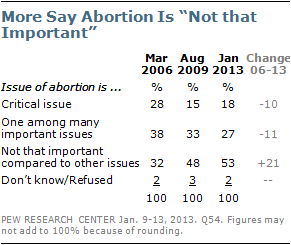 Currently, 53% say abortion “is not that important compared to other issues,” up from 48% in 2009 and 32% in 2006. The percentage viewing abortion as a “critical issue facing the country” fell from 28% in 2006 to 15% in 2009 and now stands at 18%. 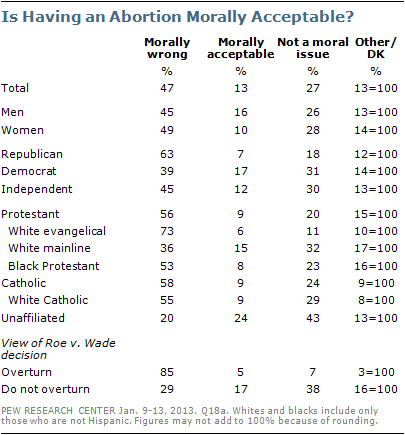 However, the public continues to be divided over whether it is morally acceptable to have an abortion. Nearly half (47%) say it is morally wrong to have an abortion, while just 13% find this morally acceptable; 27% say this is not a moral issue and 9% volunteer that it depends on the situation. These opinions have changed little since 2006. White evangelical Protestants are the only major religious group in which a majority (54%) favors completely overturning the Roe v. Wade decision. Large percentages of white mainline Protestants (76%), black Protestants (65%) and white Catholics (63%) say the ruling should not be overturned. Fully 82% of the religiously unaffiliated oppose overturning Roe v. Wade. Half of Americans who attend religious services at least weekly favor completely overturning the Roe v. Wade decision, compared with just 17% of those who attend less often. Republicans are evenly divided over whether the ruling should be overturned: 46% say it should, while 48% say it should not. By wide margins, Democrats (74% to 20%) and independents (64% to 28%) oppose overturning Roe v. Wade. There is no gender gap in opinions about Roe v. Wade: Nearly identical percentages of women (64%) and men (63%) oppose reversing the decision. 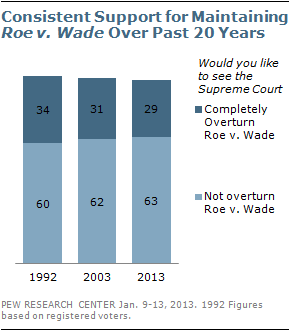 About six-in-ten Americans (62%) know that Roe v. Wade dealt with the issue of abortion. Much smaller percentages incorrectly associate the decision with school desegregation (7%), the death penalty (5%) or environmental protection (5%); 20% do not know. There also are educational differences in awareness of which issue Roe v. Wade addressed. Fully 91% of those with post-graduate education know it dealt with abortion, as do 79% of college graduates, 63% of those with only some college experience and 47% of those with no more than a high school education. 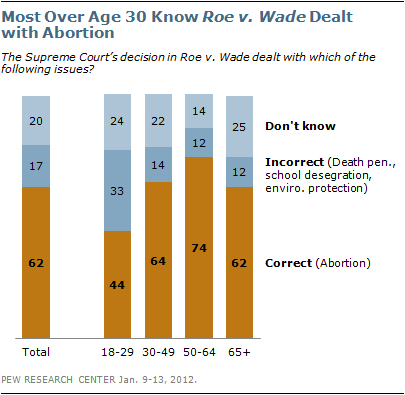 Identical percentages of women and men (62% each) are aware that Roe dealt with abortion. Nearly seven-in-ten Republicans (68%) answered this question correctly, compared with 63% of independents and 57% of Democrats. Slightly more than half of adults (53%) say that abortion is not that important compared with other issues. About a quarter (27%) say abortion is one among many important issues facing the country, while 18% view abortion as a critical issue. Those who would like to see Roe v. Wade overturned are particularly inclined to view abortion as a critical issue facing the country. Nearly four-in-ten (38%) of those who support overturning the abortion ruling say abortion is a critical issue, compared with just 9% of those who oppose overturning Roe v. Wade. 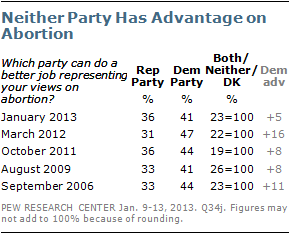 Among those who favor retaining Roe, 68% say abortion is not that important compared with other issues. Nearly three-in-ten white evangelical Protestants (29%) view the issue of abortion as critical, compared with just 13% of white mainline Protestants and white Catholics. Majorities of white mainline Protestants (61%) and white Catholics (59%) say abortion is not that important compared with other issues. 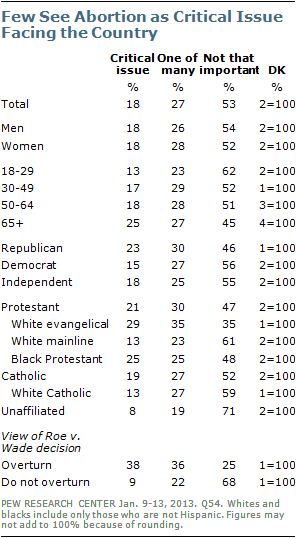 An even higher percentage of religiously unaffiliated Americans (71%) say abortion is relatively unimportant. Nearly half of Americans (47%) say they personally believe that it is morally wrong to have an abortion, compared with 27% who say it is not a moral issue, 13% who find it morally acceptable and 9% who volunteer that it depends. These opinions have changed only modestly in recent years. There are deep differences among religious groups, as well as a wide partisan gap, in opinions about the moral acceptability of having an abortion. Most white evangelical Protestants (73%), as well as 55% of white Catholics and 53% of black Protestants, say it is morally wrong to have an abortion. That compares with 36% of white mainline Protestants and just 20% of the religiously unaffiliated. A majority of Republicans (63%) view having an abortion as morally wrong, compared with 45% of independents and 39% of Democrats. Relatively small percentages of people in all religious, partisan and demographic groups say it is morally acceptable to have an abortion. However, nearly half of Democrats say either that having an abortion is morally acceptable (17%) or that it is not a moral issue (31%). Among independents, roughly four-in-ten say it is either morally acceptable (12%) or that abortion is not a moral issue (30%). Those who favor overturning Roe v. Wade overwhelmingly say it is morally wrong to have an abortion; fully 85% express this view. Opinions about the morality of abortion are more divided among those who oppose overturning Roe. Nearly four-in-ten (38%) say abortion is not a moral issue, while 29% say having an abortion is morally wrong; just 17% of those who favor retaining Roe view abortion as morally acceptable. Overall, nearly one-in-five Americans (18%) say they personally believe that abortion is morally unacceptable, yet also oppose the Supreme Court overturning its Roe v. Wade ruling. The survey finds that 41% say that the Democratic Party can do a better job of representing their views on abortion; nearly as many (36%) say the Republican Party could do better. Last March, the Democratic Party held a 16-point advantage as better representing people’s views on abortion (47% to 31%). In October 2011, the Democrats led by eight points on this issue (44% to 36%). The analysis in this report is based on telephone interviews conducted January 9-13, 2013 among a national sample of 1,502 adults, 18 years of age or older, living in all 50 U.S. states and the District of Columbia (752 respondents were interviewed on a landline telephone, and 750 were interviewed on a cell phone, including 369 who had no landline telephone). The survey was conducted by interviewers at Princeton Data Source under the direction of Princeton Survey Research Associates International. A combination of landline and cell phone random digit dial samples were used; both samples were provided by Survey Sampling International. Interviews were conducted in English and Spanish. Respondents in the landline sample were selected by randomly asking for the youngest adult male or female who is now at home. Interviews in the cell sample were conducted with the person who answered the phone, if that person was an adult 18 years of age or older.